Jewelry: John Hardy // Bamboo Collection bangle, Bamboo Collection bangle with diamonds, Bamboo Collection Ring. Skirt: Roksanda, Jacket: Burberry. Shoes: WhoWhatWear. Top: Pixie Market. Lips: Stila. I am spending the last few moments leading up to the holidays here in the city. There is something so magical about New York City at this time of the year and I am soaking it all in! I am so excited to see friends this week before we all travel home. 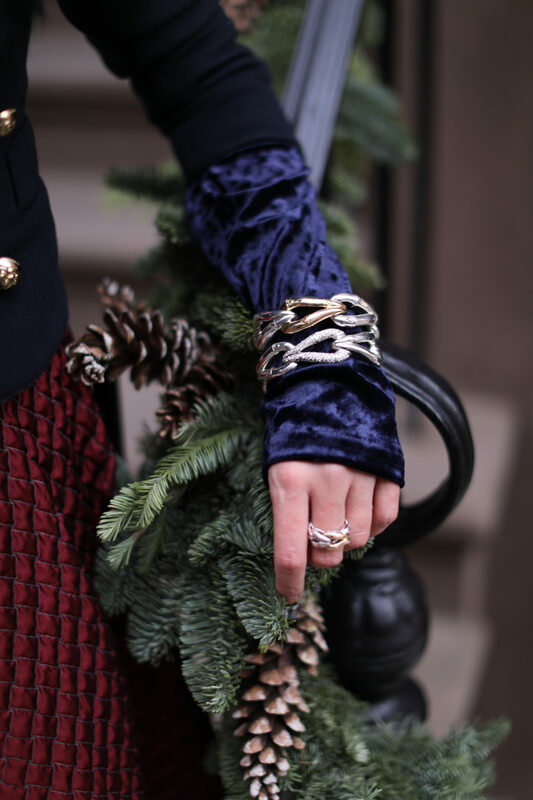 I have paired these beautiful John Hardy pieces from their City Holiday collection back to jewel tones, creating a festive look for any holiday gathering. I also wanted to share the new video I made visiting the new John Hardy store at 118 Prince Street in SoHo – click below to watch and learn more about the space here! Videography by Sarah Tricker. Que maravilla de faldaaaaaaaaa, PRECIOSA. La verdad que el entero es una pasada, pero la falda me chifla. Such a gorgeous outfit! Absolutely beautiful! Could you be ANY more perfect?! Love this post and that video! Did the Burberry coat come with the collar?. I’ve been looking for one like this! Fabulous as always and that skirt is everything a girl needs for the cold! Love it!! This look is so chic..love the skirt!!! Oh my, what an outstanding and super stylish outfit!!! Looks like the most amazing experience! Beautiful look – colors look so nice together, jewellery is so gorgeous. Video is great!! I like the video and the look is so elegant and stylish. Holiday vibes through the outfit, love it!!!! LOVE that full burgundy skirt! The texture is so good! Such a beautiful outfit! And amazing video! Really pretty look, both the jacket and the skirt are so chic! Gorgeous outfit. Love the jacket! Wow, that skirt is amazing! That coat is simply stunning! You look absolutely incredible! <3 Everything about this look is just gorgeous. What a gorgeous look! I love how rich the quilted skirt feels, and the beautiful burgundy color is perfect for the Christmas season. What a regal look! I love it! The skirt is simply amazing. And the colour of your shoes – it’s my favourite! You matched the whole outfit perfectly! I am dying over this look! From the skirt to that amazing jacket!